Today I’m switching another graphical template from last season back on, which looks at what can still happen across the Premier League and EFL this season. 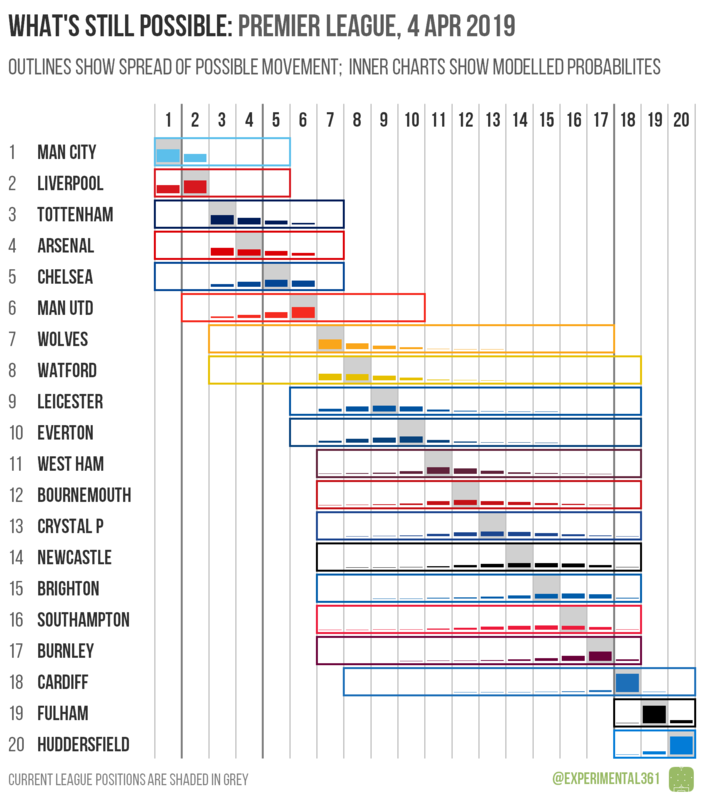 The way these work is pretty straightforward and it’s exactly the same idea as the weekly permutations: the outer bar shows what’s mathematically possible over the rest of the season while the inner chart is a distribution of what’s actually likely to happen based on my latest model predictions. While it’s incredibly unlikely that Man City or Liverpool will be dislodged from the top two, either of them could still technically finish outside the top four. Watford are unique in still being mathematically capable of qualifying for the Champions League or being relegated, although anyone from 8th to 18th could still technically go down. 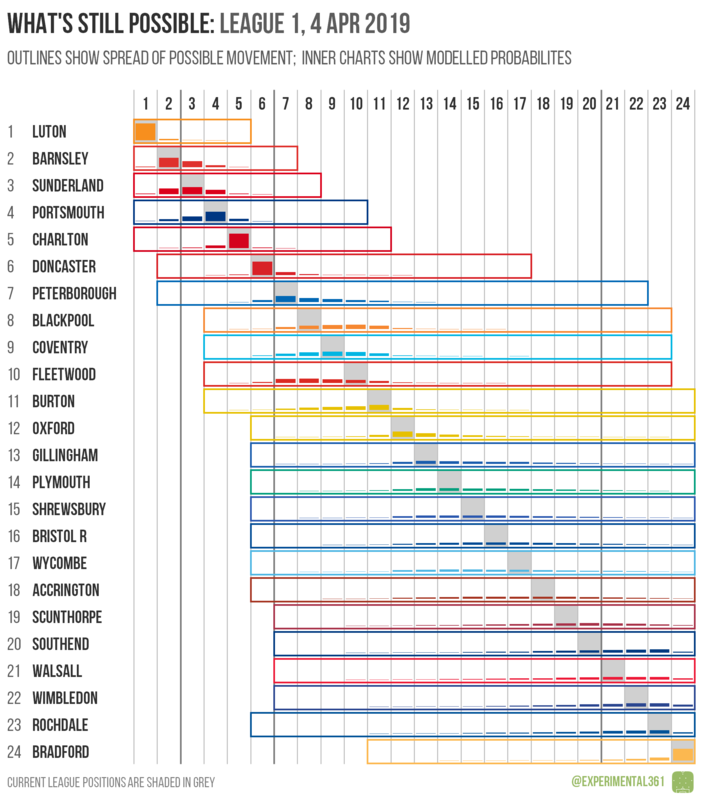 Leaders Norwich are already guaranteed at least a play-off finish, while everyone outside the current bottom three could technically still make the top six and everyone down to 11th-placed Sheffield Wednesday is mathematically capable of securing automatic promotion. 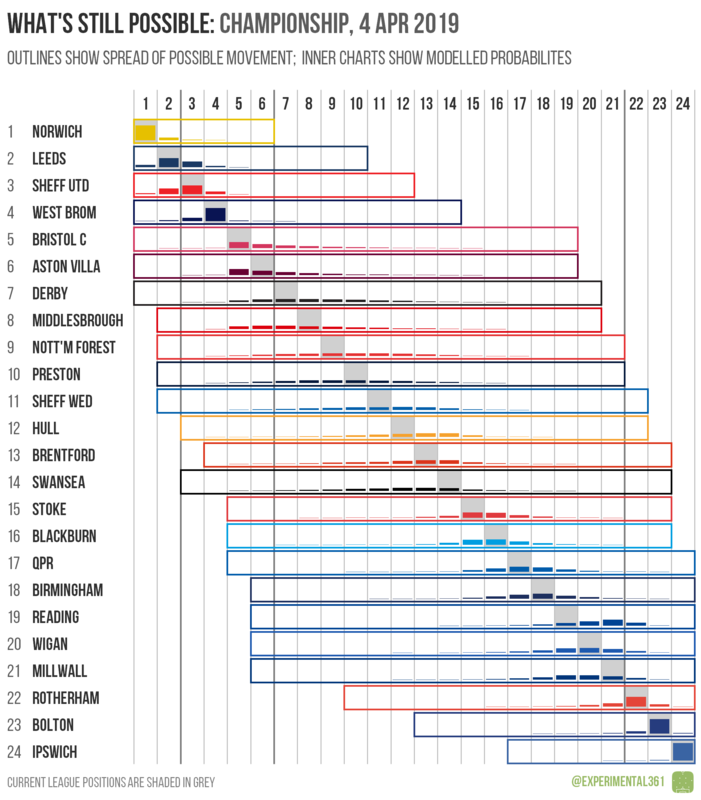 The Owls are also the only side who are still able to be either automatically promoted or relegated, although everyone from Hull down to Millwall could either drop into League 1 or reach the Premier League via the play-offs. Like Norwich in the division above, Luton can’t finish below the play-off places any more, and incredibly all but five of the teams in the division could join them in the final top six. This includes 23rd-placed Rochdale thanks to their game in hand. Furthermore, everyone below the current top six could still technically go down, although even in such a close division it’s pretty unlikely for a lot of them. 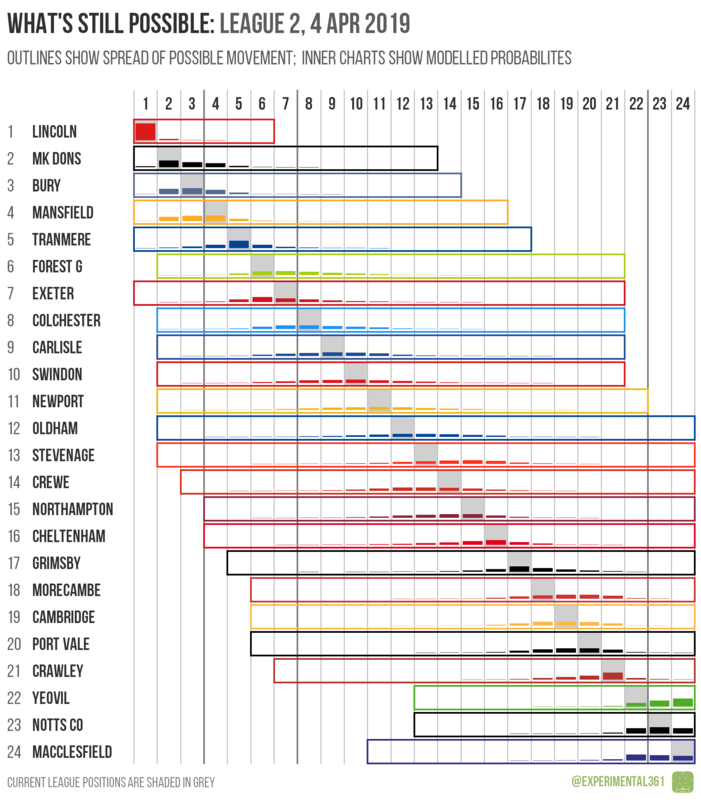 Lincoln make it a trio of EFL league leaders who are mathematically guaranteed at least a play-off spot, but nobody else is even assured of a top half finish as it stands and only the current bottom three couldn’t make the play-offs with the right combination of results. Everyone down to 14th-placed Crewe could technically still secure automatic promotion and even in a division with only two relegation spots there are still 13 teams – everyone from Oldham downwards – who are mathematically still at risk of dropping into the National League.